The former home of Dana Falafel Shawarma Deli will be offering falafel again – and flavored tobacco, as well. 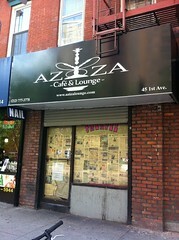 In the next weeks, a hookah lounge will open in the modest storefront at 45 First Avenue, near Third Street. Stu El-Boghdedy, the manager of the forthcoming Aziza (a girl’s name meaning “beloved” in Arabic) gave The Local a sneak peek into the 35-seat lounge decorated with Moroccan lanterns, fabrics and poufs. In addition to Egyptian water pipes, he said, he’ll be serving light appetizers such as hummus, falafel, grape leaves, and eggplant salad as well as non-alcoholic drinks such as Turkish coffee, mint tea served in ornate teapots, and salep, a sweet, hot milk drink. Mr. El-Boghdedy said hookahs would go from $12 to $35 or $40, which raised the question: why are water pipes at the East Village’s numerous smoke dens so expensive, anyway? He cited Al Fahker, an Arab brand, as the top of the line. A 250-gram box is $12.99 at Hookah & Shisha Central.